All of our Hybrids are automatic. They have been designed to be easy and enjoyable to drive. To get started all you have to do is hit the power button, there is no noise but effortlessly the car is ready to go! From there on you don’t have to think about anything apart from watching the road. The Hybrid system controls itself and uses all of its resources to drive as efficiently as possible. All of our Hybrids have 2 engines – Hybrid and petrol. All you have to do is drive, the car does all of the hard work. Whilst driving the engines work together switching between the two, electric at lower speeds and using petrol-power when needed or using both together when you need more power. It doesn’t matter how far you go, the battery in a hybrid car is charged from the engine and regenerative braking. You don't need to worry about plugging it in – ever!. Throughout the course of 2017 we successfully supplied over 1,000 vehicles to fleet and business customers, the majority of which were Petrol/Electric Hybrid vehicles. With our assistance, many of our customers were able to switch to the more modern and cost efficient Hybrid System for the first time. This simple transition has enabled our customers to benefit from vehicles with a high standard of specification whilst reducing their whole life costs, overall CO2 emissions and lowering their taxation liability. In summary, our hybrid vehicles work to save your business and vehicle users’ money. It’s a new year and we’re sure just like us you have new budgets. It really is worth checking how much you and your business can save this by changing your fleet of vehicles (whether that be 1 or more cars) to Hybrid. 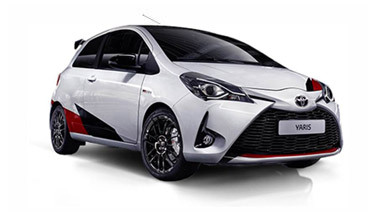 Hybrid vehicles start from £199+VAT per month - Yaris Hybrid. Apply here for a free vehicle audit for your business.